On the eve of our first friendly games for the coming season comes the surprise announcement that star striker Iyseden Christie will miss, at least, the opening games against local opposition. He had further surgery on his troublesome ankle after the end of last season - that seems such a long time ago - but has not recovered sufficiently to warrant his inclusion in the games at Rushall Olympic tomorrow and Bewdley on Sunday. All the others should be playing including James Constable who also went under the carving knife for surgery on his groin. He arrived at the club from Walsall with the injury and has played most of the games with the help of pain killing drugs. All players will be getting either a full game or at least part of one over the weekend and this will mean first sightings of Justin Richards and Dean Coleman plus a chance to renew acquaintances with Andy Ferrell and Paul Bignot. There will also be a selection of triallists to choose from but the only names mentioned so far are Matt Barnes-Homer and Jon Adams. M B-H has frequented the local scene for a couple of years now until he got his big chance at Wycombe and blew it. 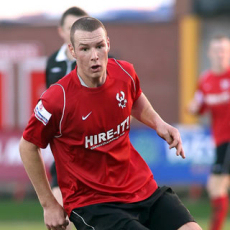 Adams was originally with Rushden but has played at Leamington for the past few seasons where he was highly thought of. Mini match reports will on the site on Sunday evening.